From June 20th to July 14th, Olwethu Katase came to the San Francisco Bay area to train intensively and participate in a cultural exchange as the recipient of Gugulethu Ballet Project’s 2018 Project Relevé Scholarship. During her time here, Olwethu received ODC’s prestigious Thea Anderson Scholarship, awarded each year to a young person who is committed to dance and social justice. 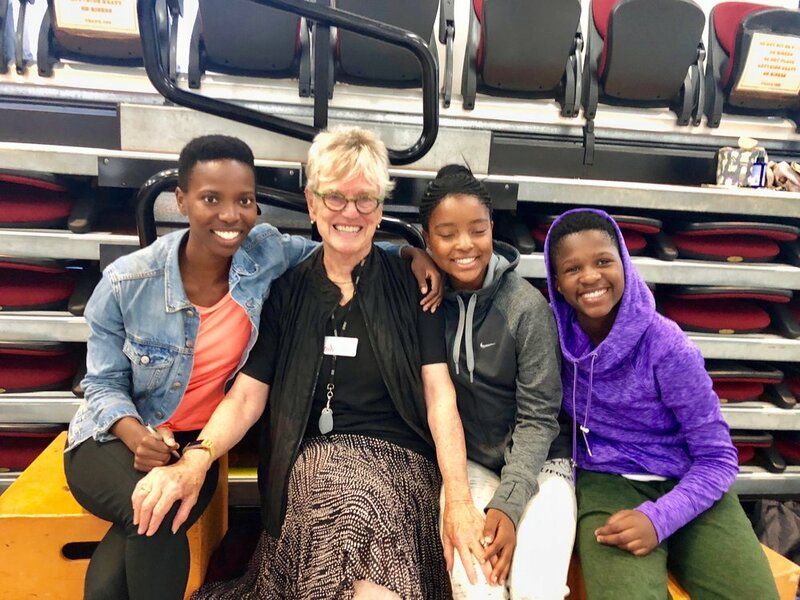 For three weeks, Olwethu studied at ODC Dance Commons under the mentorship of ODC Founder and Artistic Director Brenda Way and ODC School Director Kimi Okada. Olwethu is the founder and director of Igugu-Lethu Arts and Leadership Project, a Gugulethu Ballet Project partner school located in the Gugulethu township in South Africa. Igugu-Lethu Arts and Leadership Project uses the language of dance to develop artistic skills while advocating and promoting education. Olwethu generously shared with us her reflections on her summer with Gugulethu Ballet Project and gave us permission to share them. Below we have excerpted some of her thoughts. What did you gain from your stay in the U.S. as a Project Relevé participant? Being in a different part of the world has opened me up as a young artist. I have always known that there is a different world out there and people whom I can learn and connect with artistically and whom I can exchange my own personal experiences that have an influence in the way I work as a dance artist. I connected with a lot of different people whilst I was there who were very warm and welcoming and portrayed a genuine interest in knowing who I was and what kind of work I do in South Africa, the creation of networks which made me think beyond what I had envisaged for myself and Igugu-lethu Arts and Leadership Project. There was definitely a positive paradigm shift in the way I think and view things. I am more confident in myself as an artist and as a person who is passionate about community development. I am most definitely not the same person I was before I left for the USA, through my engagement with different people, taking dance classes and seeing the standard of training over there has made me want to work even harder and diversify the way in which I teach. What aspect of your trip to the U.S. has been most useful to you at home? Taking classes at Oberlin Dance Company was really fruitful for me. Being granted the opportunity to take unlimited dance classes exposed me to different styles of teaching methodologies. Each dance teacher’s class that I attended had a unique dance vocabulary and that aspect also helped broaden my vocabulary as a dance artist and teacher. The warm and welcoming communal atmosphere in the space has stayed with me and the giving of a 100% by the dance teachers has also influenced my way of teaching. I now understand the importance of laying a good foundation when it comes to teaching, it is very important to scaffold and understand each dance student’s way of moving. The dance learners at Igugu-lethu Arts and Leadership Project dance in a community hall, through my experience at ODC It is my mission to always create an inviting, safe and positive environment where children can feel like they are in a safe and communal space and not a competitive space. In improving the dance learner’s training, I have tried to create partnerships where the learners can receive training outside of Gugulethu and by different people. How has this trip changed you personally? Personally I am more driven, hardworking and goal-oriented. I am also now not afraid to speak up if there is something that I feel is not good for me. Because I was exposed to a standard of excellence and engaged with people who were making the impossible possible and instead of seeing problems as stumbling blocks to achieving certain goals, they instead looked for solutions. My mentality is currently in that wavelength, I am in a mental state of I can do it and I will find different strategies to make my vision a possibility. How has this trip changed you professionally? Professionally, I am more goal-driven. I do not limit myself, since being back I have made it my mission to create connections with like-minded people and with people who believe in my vision of growing Igugu-lethu Arts and Leadership Project to become bigger and impact the lives of the youth in Gugulethu and beyond in a positive way by using the arts as a catalyst. Academically I am in a process of finishing my Post-graduate education in teaching and will be doing my honours in 2019. The exchange program is a fantastic initiative that allows South African kids to experience a life outside South Africa and be inspired by the high standard of dance abroad. To make the program more effective it would be great if you could do a follow-up on the young kids who have been selected before and see how their lives have been influenced by being there and what their lives are like in South Africa and how they are doing at school. I have a dream of building an arts centre in Gugulethu, a safe space designed to attract the youth to partake in different art forms and where they can learn life skills as well. This place could also be a home for the Gugulethu Ballet Project. A place where they bring professional dancers from abroad to come in and give dance workshops and performances, it can also be a cultural exchange where the artists can get to explore Township lifestyle, the different cultures and the way of life in South Africa. Olwethu with ODC Founder and Artistic Director Brenda Way and fellow 2018 Project Relevé recipients Linathi Louw and Thimna Ndwe. Olwethu with ODC School Director Kimi Okada and ODC company dancers after a rehearsal. Olwethu in front of ODC Dance Commons in San Francisco.